The last time Ray saw his friend Jon, Jon was in the wheelchair to which Ray’s misaimed bullet confined him. Now Jon is walking on his own two feet. It’s not thanks to advances in neurology or prosthetics. It’s thanks to a healing spell Jon and his pals acquired from … someone. However the magic works, it gave Jon his legs and gave Jon’s friends Echo, Macy and Payton increased vigour and health. It also seems to have had an unfortunate effect on their social skills; conversations all too often veer towards confrontation. Still, Jon is certain the ritual is a good thing, one he is eager to share with Ray. Annalise Powliss is one of the Twenty Palace Society’ adepts. She has a much clearer idea about the source from which Jon is drawing his new abilities. She also has a very clear idea how to handle the situation: one quick and brutal ambush. It’s a bold plan but — alas — not successful. Although Annalise isn’t inclined to explain herself to lesser beings like Ray, his impressive skill at not dying earns him a few tidbits of infodump. The most important of which is that his friends have not been healed or enhanced. They’ve been infested. Jon, Echo, Macy and Payton invited extra-dimensional beings, Predators, into themselves. There’s no cure save death. The only question is whether Annalise will be able to keep the necessary death toll to single digits or if the body count will be much, much higher. The smart thing for Ray to do would be to run, but Ray didn’t get his criminal record by being smart. Ray’s too loyal to his friends to simply abandon them to Annalise. Ray’s too cunning to resist stealing a little magic for himself. Only problem is, Annalise is right and Ray? By filching someone else’s ritual, Ray has doomed himself to a lifetime spent as one of the Twenty Palaces designated redshirt. The Twenty Palaces are far less forgiving than the American public. It’s a life sentence … but at least it’s likely that Ray’s sentence will be quite short. This is one of those universes wherein the nature of the threat justifies extreme measures . I can see why this appeals to audiences and thus to authors, but I’m not crazy about it. On the one hand, mages’ disinclination to explain why they’re killing everyone in sight may make their job harder. The uninformed observer may jump to the conclusion the mages are the biggest danger in the room. On the other hand, full disclosure runs the risk that the sort of person who becomes a script kiddie in our world will instead start dabbling in things Humanity Was Not Meant to Know. It’s not as if Annalise and company have much difficulty powering through any impediments mundane authority puts in their way. Magic isn’t all summoning and being consumed by extra-dimensional horrors (although a lot of it is), but all of it has some kind of cost. Limited invulnerability inhibits sensation. Some spells demand a specific diet. Others make daylight lethal to the magician. Every mage walking the world is someone who decided power was worth paying some very precious coin to obtain. In Ray’s case, he seems to have some profoundly inhibited executive functions. He’s not stupid, as such, but caution will never be his forte. It is the difference between intelligence and wisdom. This isn’t as bad as it sounds. Making bad decisions is an excellent way to acquire survival skills. Sure, neurotypicals spend less time on fire, but people with inhibited executive functions know more about putting themselves out once they are on fire. Like many urban fantasies, the Twenty Palaces series lives a stone’s throw from the detective novels. The same essential character strengths and flaws manifest in both genres. Matthew Scudder, Travis McGee, and Easy Rawlins don’t dabble in magic, but I think they’d understand what led Ray to do so. People who like mainstream detective fiction would like these books. That is, if they have a tolerance for Lovecraftian horror. 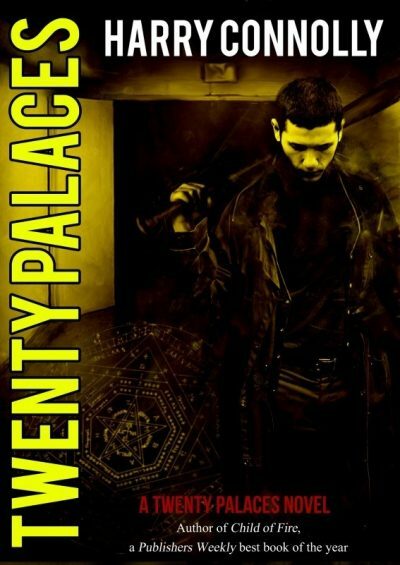 Twenty Palaces is available here (Amazon) and here (Chapters-Indigo). 1: The fact the Predators have not yet managed to eat the world suggests that (rather like Evil! over in the Buffy universe) they’re not as big a threat as they seem to be. If a handful of mages have foiled incursion after incursion for thousands of years, it follows that the odds of success of any given incursion must be pretty small.